An analysis of a Neanderthal\’s fossilised hyoid bone – a horseshoe-shaped structure in the neck – suggests the species had the ability to speak. This has been suspected since the 1989 discovery of a Neanderthal hyoid that looks just like a modern human\’s. Writing in journal Plos One, scientists say its study is \”highly suggestive\” of complex speech in Neanderthals. via BBC News – Neanderthals could speak like modern humans, study suggests. 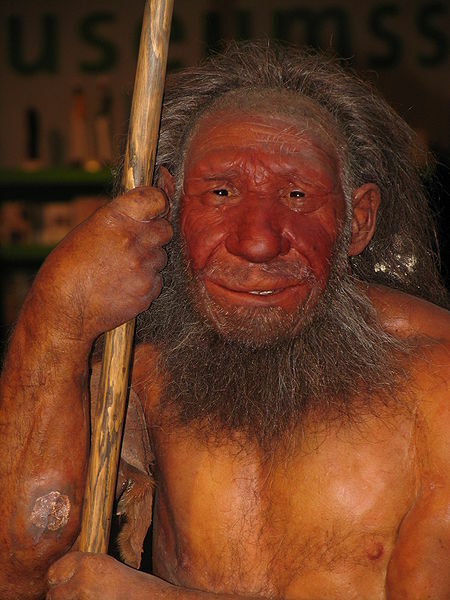 This article talks about new evidence that Neanderthals could speak, and could speak fluently. And since we and Neanderthals forked evolutionarily some 400,000 years ago, it implies that speech and language is at least that old. This doesn’t particularly surprise me. While I’ve read about a lot of theories that speech was only around 50,000 or so years old, that’s never made a lot of sense to me for a few reasons. Speech and language is a well developed feature. The idea that it sprang out of nowhere a few tens of thousands of years ago, without a lot of time going through intermediary stages seems implausible. Monkeys communicate with each other about predators and such with various screeches. These screeches aren’t language in the sense of having sentences and semantics, but they are communication and very much strike me as early protolanguage. A stage our remote ancestors probably went through. Part of our anatomy seems evolved for speech, and now it looks like part of Neanderthal anatomy is too. We also have parts of our brain dedicated to speech and understanding language. Evolution of these features took time. Of course, these could be repurposed functions, but then what were the original functions? All of this, it seems to me, points to speech being very ancient. The Neanderthal evidence seems to push it back at least half a million years. My own (admittedly inexpert) intuition is that speech development probably ran more or less in parallel with the development of sophisticated tools, meaning it developed gradually over millions of years. This entry was posted in Zeitgeist and tagged Anatomically modern humans, Evolution, Human, Hyoid bone, La Chapelle-aux-Saints, Neanderthal, New York University, Plos One, Science. Bookmark the permalink. I agree with your intuitions. It is silly to think that speech developed after the cooperative efforts to leave Africa. Communication is a primary skill in the cooperative efforts to survive and they would have been needed to survive the trek out of Africa so speech of an advanced sort would be probable to have arisen prior to leaving African continent. I would further posit that it was a trait of all modern humans and their relatives. Cooperation at a high level seems a natural requirement for the tasks leading up to exodus from the African continent. Such a journey requires organized food gathering techniques. That organization requires communication. To think that speech was not necessary prior to the exodus is just silly. Thanks. We’re on the same page. In fairness to the late speech theorists, they usually see it as developing just before the out of Africa migration, and perhaps even instigating it. When those theories were being formulated, based on archaeological evidence, that was thought to be around 50,000 years ago. With genetics now showing it was more like 60,000-90,000 years ago, I’m sure they adjusted their start date back. But I don’t think they could adjust it 400,000 years and still claim to still have the same theory. I think that we’ll find the humans that left Africa were fairly complete as modern humans… the time scale of discovery and knowledge acquisition has been logarithmic. In the early days it took decades to propagate knowledge widely – now it takes seconds but the same faculties were available for the duration… just not the same laws and traditions etc. Good point. Aside from the lack of evidence, the ancient aliens notions often cheapen the remarkable accomplishments of ancient humans, implying they couldn’t have made those accomplishments on their own.